With Men’s Health Week and Father’s Day just around the corner, it’s the perfect time to discuss some of the men’s health questions we’ve encountered. Many men struggle with societal pressures that make it difficult to admit to health concerns or to ask for help. Part of men’s health week is overcoming those pressures, and opening a better dialogue around men’s health concerns in general. So in that spirit, and since most men’s health concerns present in middle age, here are some of the health questions we’ve been asked by men approaching or over the age of fifty. A healthy diet is incredibly important. It drastically reduces the risks of type 2 diabetes, obesity, heart disease, and certain types of cancer (colon cancer, in particular). Eating a healthy diet is a surprisingly easy step that everyone can benefit from. A visit with a nutritionist can provide more precise guidelines for your particular dietary needs, but in general, a healthy diet consists of fresh produce, (more vegetables that fruits), lean meats like fish or poultry, beans, eggs, nuts (for protein as well as for healthy fatty acids), and whole grains and cultured dairy products (like yogurt or kefir) in limited quantities. Foods high in salt, refined sugar, cholesterol, and trans- and saturated fats should be avoided. The healthiest choice is to abstain from alcohol completely, but if you do drink, limit your intake to three standard drinks in a night, and no more than twelve in a week. I’ve Smoked All My Life; Is There Any Reason to Quit after 50? Absolutely yes! It’s never too late to quit smoking. The sooner you quit, the sooner your body begins to mend the damage caused by smoking. After even just a few days, the differences to your health will start to become apparent. People who quit smoking report increased energy levels, easier breathing, improved senses of taste and smell, and a gradual loss of the persistent “smoker’s cough”. Beyond the simple benefits, quitting smoking severely reduces one’s risk of heart attack, stroke, and high blood pressure. Quitting at any age can add years to your life. What’s a Healthy Level of Physical Activity after 50? There’s no one-size-fits-all answer to this question, but there are some general guidelines that anyone can benefit from following. Exercises fit into two broad categories. Cardio (or aerobic) training works groups of muscles, and exercised the cardiopulmonary systems of the body. It increases blood oxygenation, strengthens the heart, improves energy levels and cognitive attention, and promotes overall wellness. Walking, running, biking, swimming, and so on are good choices for cardio training, no matter your skill level. Strength training, on the other hand, focuses on higher impact exercises and builds specific muscle groups. Think weight lifting, isometric exercises like pull-ups and dips, and their like. The best exercise programs will include both types, but for men (or anyone) who haven’t led an active lifestyle earlier in life, it’s best to consult a physician or a qualified trainer before undertaking any new exercise habit. Whatever your fitness level, you should be getting at the very least 150 hours of moderate aerobic activity (that might be something as simple as a brisk walk, depending on your ability) per week, and at least two weekly sessions of strength training. What Health Screenings Should I Be Getting after 50? 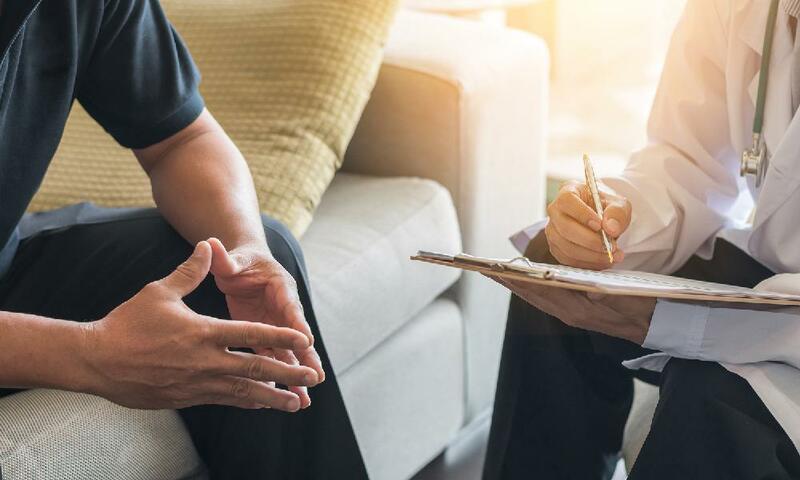 There are a number of health screenings that become increasingly important after 50, particularly when it comes to men’s health. The specific screenings appropriate for any one person will depend very much on personal and family health history, and lifestyle habits, but there are some that should be checked regularly for anyone. This is certainly not an exhaustive list, for which you should book a consultation with a physician, but it is reasonably comprehensive, and should give you a good place to start. Prostate cancer can be screened for with a simple blood test, for the PSA (Prostate-Specific Antigen) for early detection. Men over 50 should be screened, but be advised that there is a higher genetic risk regardless of lifestyle for prostate cancer in men of African descent, for whom regular screenings should be done even earlier in life. Several types of screenings are available to discover precancerous polyps in the colon, and the American Cancer Society recommends regular screenings for men between the ages of fifty and seventy-five. These screenings are particularly encouraged for men with a family history of colon cancer, so consider getting screened earlier in life as appropriate. Speak with a physician for more exacting guidelines, for your own situation. This is perhaps the easiest test on our list. Easy, painless, and totally non-invasive, blood pressure should be checked at least once every couple of years for anyone over the age of twenty. High blood pressure increases the risk of stroke and heart attack, as well as other diseases, and since screenings are so quick, there’s no reason to miss the chance to improve your health. High cholesterol, like high blood pressure, increases your risk of heart disease and stroke. A test for cholesterol levels is generally recommended about once a decade for men over twenty, but those screenings should become much more frequent in, and after, middle age. They may also be recommended for anyone with a family history of heart disease, other risk factors (like diet, sedentary lifestyles, or poor diets), or those with a known heart condition or congenital defect. Advanced Health, practices an integrative approach to medicine, combining lifestyle habits, diet, psychological counseling, and other treatment vectors to promote and preserve health and wellness, especially later in life. For men over fifty, or anyone, this sort of treatment can help to identify and solve medical problems earlier, helping to ease aging and making for a longer healthspan, as well as lifespan. Now is the perfect time to call and to make an appointment for a consultation with a physician to identify and treat any of your own health or wellness issues. When it comes to men’s health, it’s always the right time to start those conversations.